The Peak of Chic®: A Thing of the Past? Last week, The New York Times Dining section had an interesting article on the venerable Philadelphia restaurant Le Bec-Fin and the retirement of its star chef Georges Perrier. For forty two years, Perrier, who some deem to be America's version of Paul Bocuse, has been responsible for making Le Bec-Fin one of this country's most esteemed restaurants. But what has not boded well for Le Bec-Fin nor Perrier is its formal, elegant atmosphere and its lauded menu of classic French cuisine. It seems that few people feel comfortable dining in a formal restaurant anymore, and that's truly a shame. The article quotes a Philadelphia restaurant critic as saying that it's difficult to entice customers to dine in a restaurant that "looks like Louis XIV's boudoir." Dining room photos show a space that is exquisitely sumptuous, and who wouldn't want to get dressed up and dine in such a room, especially on special occasions? But the kicker, for me at least, was this statement that described the restaurant's stodgy ways: "Le Bec-Fin was still presenting butter under little silver domes." Well, what is wrong with that? I serve butter under a little silver dome at my dinner parties, and I don't consider that to be stuffy at all. It's an attractive and easy way to serve butter, and it obviously beats serving your "I Can't Believe It's Not Butter" from its plastic tub. Unfortunately, fine dining is becoming something of a relic, and no where is that more true than in Atlanta. While I may not have many formal restaurants to support in my area, I can do my part by continuing to serve my butter from its silver domed dish. Image at top: My Ercuis silver butter dish at the ready in my kitchen cabinet. 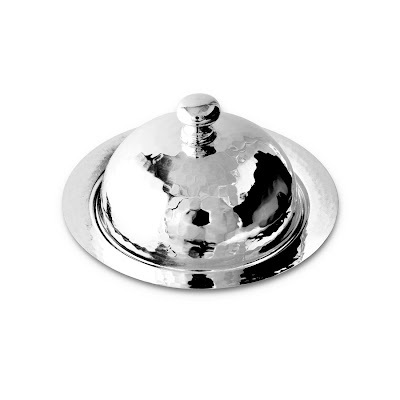 Christofle silverplated butter dish, designed by Andree Putman, available at Michael C. Fina. 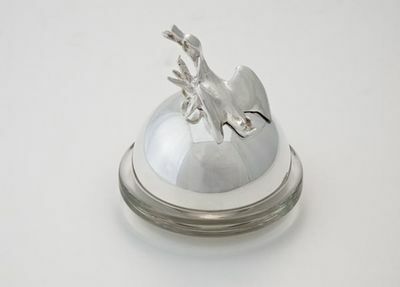 Ceramic and pewter butter dish by Match, available through Michael C. Fina. It really bugs me when civilized, lovely traditions are dismissed as gauche because they are old and less familiar. Keep that silver dome. There is one such on the breakfast table at our hotel in London shown in my post Patience and breakfast. 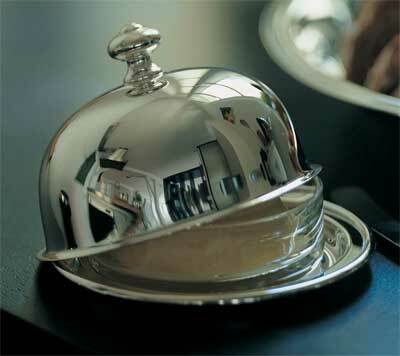 I only associate lidded butter dishes with hotels. We own a lidded, old-fashioned, ceramic butter dish but it only appears at breakfast. The history of such items and their migration to the domestic table is very interesting. 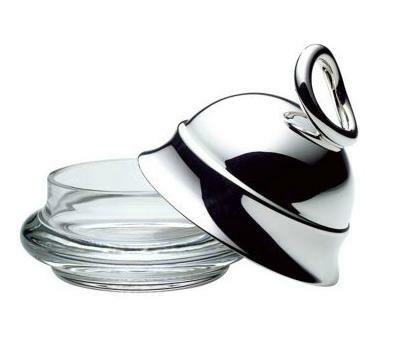 I use a beautiful crystal domed butter dish every day and have a silver one for special occasions. It makes me smile at 6 AM and that's no small thing. It's a shame that this country is losing a lot of gracious living to so-called convenience. Blue, Indeed there was! I missed that when I read the post. Wendy, how lovely. It's nice to add a few special touches to one's breakfast! Kerry- So true! Just because a custom is old, it doesn't mean it's stuffy! Its been 15 years, but my meal at Le Bec-Fin was an exquisite experience. It really is the little things like a silver butter dish that make it a special occasion. How sad that it is being characterized as "stodgy". The deciding factor around the country might be more an issue of dress than setting. When so many men wore jackets and ties to work, it was not an issue to wear the same to dinner, usually going directly from the office. But it's the changing for dinner that is hurting these more formal restaurants, in my opinion. Naturally, cost and a decline in skilled service figures into the decline of such restaurants, too, but those factors seem to be easier to control. Stacy, lucky you that you have dined at Le Bec-Fin! I agree that these gracious touches make for a special dining experience. David, Now that's a story! I have the boxed set of auction catalogues; I'll have to consult them this afternoon. Fascinating! Unfortunately, people don't go out to dine these days. They go out to "eat". Graciousness has gone the way of civility. Love your blog. Classicist, I think that you're correct that dress is part of the issue. But, I think it goes beyond that. Our society has become dismissive of anything that seems to require an effort, whether that be putting on a jacket when dining at a restaurant, learning proper table manners, cleaning one's house (people don't clean like they used to), or even God forbid reading a book. Pat, How very right you are! Well said. Such a strange thing for the author to pick on - the domes on butter? It seems hygienic to me! I too think the de-formalization of society and culture is a very sad thing and am hoping for a reactionary movement! We should expect nothing more in the Age of Vulgarity. There was a lot wrong with Le Bec Fin, and the butter domes were the least of it. They lost two "bells" - the Philly Inquirer equivalent of Michelin stars, and Perrier's ego got hugely in the way of everything. I'm not saying he didn't deserve to have that ego, but service had slipped, and so had the over all experience. I would have loved to have visited in its heyday, and I hope to someday go once it recovers. Stefan, Yes, a reactionary movement! That's what we need to participate in! Untouched Takeway, I hope that the restaurant gets back on track so that it can regain some of its former glory. Bravo! Never let down standards. Times change but it is also true that the more they change, the more they remain the same. My mother dropped the use of formal hollow ware at table years ago. Thank God it was not tossed, but packed away. The granddaughters saw it all in action this past Thanksgiving when I decided to do a full court press dinner and the girls were entranced by the majesty of it and the sense of occasion it brought to the day. Different is not always better. I agree with everyone's sadness about the state of affairs in our "Age of Vulgarity." I think butter dishes are lovely in their own right and I have a wee collection. I think of them as finials/boxes and set them about. I do remember when my son's high school girl friend came for Thanksgiving dinner and our table was set with our china, crystal and silver and she started to cry because she didn't know how use the silver in the right order. It made me sad for her...and eventually glad that he married someone else! I am so with you on this Jennifer! Nothing stodgy about presenting a meal with in the most beautiful ways. I also love to present every part of a meal with special tabletop. I always hunt for unique items to make a table more interesting, and my dinner guests all appreciate it. 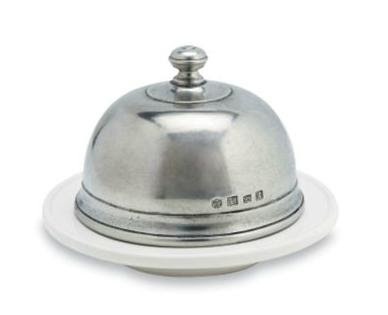 When it comes to restaurants, such special presentations as a domed butter dish also elevate the dining experience. Frankly, when I go to a fine restaurant with a check that can feed a small country I expect a little pomp and circumstance. gosh those are cute...especially the canard one. would also love to see the salt cellars come back with the tiny little spoons..oh the good ole days! Oh yes, I love salt cellars too! Hurrah! Let's have a 'bring back the butter dish' day. I use a small crystal or silver butter dish - and butter knife; essential for not leaving crumbs in the butter, my bete noire. We also use salt cellars and spoons. I especially like the canard dish. It's possible to be modern and chic and still keep up standards. There is a certain pretentiousness about french restaurants. Victoria, so true. One can be modern and still adhere to tradition. I love using my butter dish. But believe me, my dinner parties are anything but stuffy. Rather, they're laid back and easy. Salt cellars and spoons are another fab table accessory! I live just outside Philadelphia and I think the issue with LBF closing has nothing to do the decor or the presentation (I too love my salt cellars and butter domes), but rather menu itself. The upstairs bar where you could have dinner was quite popular because the menu was not so rich and outdated (forgive me, but true). This also does not belie the issue of Mr. Perrier himself (who has an ego larger than life) and the numerous times it was going to close, then reopened, closed, opened, etc. He has another restaurant just by me, Georges, that is quite popular because the menu is good. Cyn, thank you for this additional information. And yes, I agree with you about not being able to eat rich food very often. Lucky you that his other restaurant is close to your home! I want to sign up for the reactionary movement!! I have a 42 year old daughter to whom I gave my Mother's and Grandmother's beautiful silver, china, crystal...and butter domes, salt cellars with tiny spoons! I cannot tell you how much fun it is to have Thanksgiving, Christmas, and formal dinner parties on my Mother's dining table! And see all those beautiful things! She even has "butter balls" made to go in the butter domes! My beautiful mother used to have black-tie dinners every Friday night when I was growing up in Pasadena!! That was the dumbest comment! Refinement and elegance are not stuffy! Makes me blush to remember my plastic butter dish. I need to buy a really nice one to make Sunday brunch even more lovely. I love this old "stodgy" stuff, even though I feel incredibly ill at ease with much of it, by virtue of my own ignorance. Thanks for this blog - it's been such an important part of my visual education!